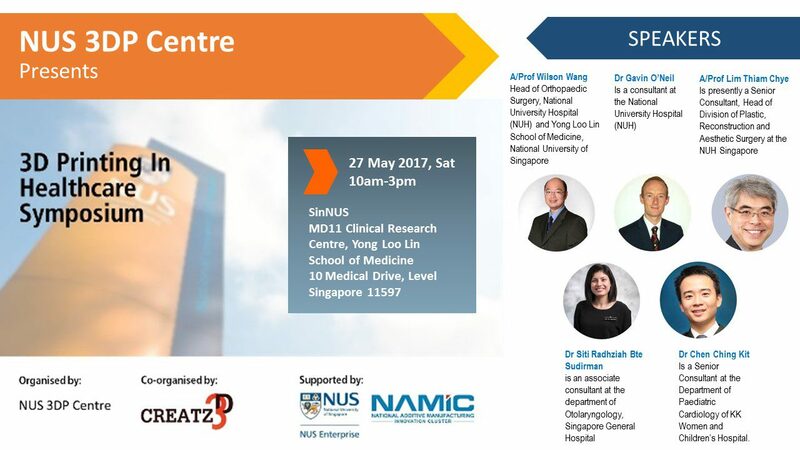 This medical symposium is organised by NUS 3DP Centre in collaboration with local 3D printing firm Creatz3D. This event builds on the previous success of the Creatz3D medical luncheon in 2015-2016, where solutions and benefits of 3D printing in Singapore’s healthcare industry were shared..
Benefits of 3D printing in healthcare include:Customization and personalization of medical devices and surgical planning. Increased cost efficiency of high-mix low volume devices. And enhanced productivity through increased success rates and minimising revisions.